Dürer to Diebenkorn: Recent Acquisitions of Art of Paper, National Gallery of Art, Washington, D.C., 1992, no. 15. "Rudolf II and Prague: The Imperial Court and Residential City as the Cultural and Spiritual Heart of Central Europe", Prague Castle Picture Gallery, 1997, no. 237. Art for the Nation:Collecting for a New Century, NGA, Washington, D.C., 2000, 160. Plomp, Michiel. "Artist Collectors in the Dutch Republic in the Seventeenth and Eighteenth Centuries: Jacob de Wit, a Special Case." 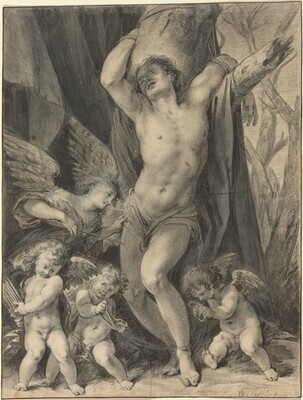 In L'Artiste Collectionneur de Dessin II, De Giorgio Vasari à Aujourd'hui. (Rencontres internationales du Salon du Dessin, 21-22 mars 2007.) Milan, 2007: 81, 83, note 43, 212, fig. 15.